Of course now, as a husband and father of three, the attic holds no such frivolity populated as it is by suitcases, Christmas trees and blow up beds. A library of life’s minutiae. However, among the dust, wedding dress box and children’s Wellingtons there is one container which provides happy connection between the present and those halcyon days when heading up to the attic meant so much more. In the far corner, stuffed unsequentially into a translucent container also home to Only Fools and Horses videotapes and around 200 copies of Boxing News, are my scribbled notes from the first shows I attended as something purporting to be a fight reporter. Among the notebooks will be my attempts to convey the eruption that shook the York Hall when Danny Williams dumped lantern jawed Kali Meehan on the canvas in the opening round and there will be page after page of “Roberts moves away, pecking with jab, looks nervous” as I perched ringside waiting for Steve Roberts to stumble into a fight. One notebook will reflect one of my most memorable nights at the fights. Unsurprisingly, it was another night at the York Hall headed this time by Richard Williams in the fight before the dashing Light-Middleweight tangled with Sergio Martinez as the favoured fighter. How times change? The York Hall’s repute as the Home of British boxing has always struck me as somewhat regionalist but there are precious few venues to match it when the fight draws a crowd, that night in March 2003 was one such night. However, the night was most memorable for events occurring elsewhere as the whisper spread through the press rows that mustachioed veteran Corrie Sanders had flattened Wladimir Klitschko in two rounds. That caused a stir. 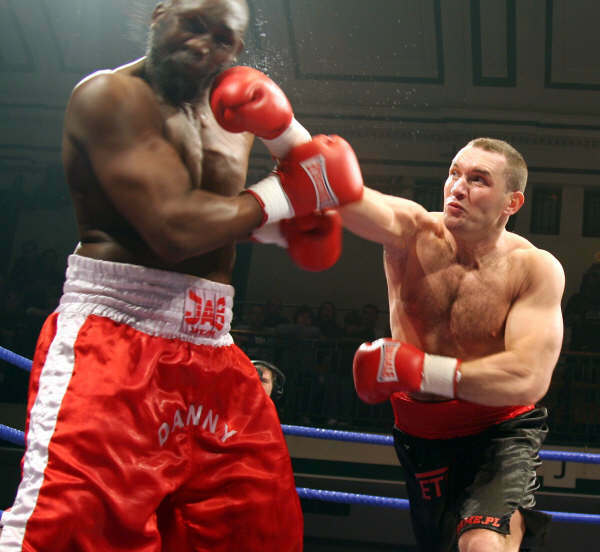 Klitschko the younger was of course the heir apparent to Lennox Lewis possessing some of the old King’s power, height and style. Or so the story was sold. The years since have proven that to be as credible a conclusion as the one which presumed current Middleweight star Sergio Martinez would be a formality for Richard Williams. Second only to the South African’s demolition of Wladimir Klitschko was the post main-event contest that pitched two Eastern European heavyweights together. The loser would later be described to me by the promoter as a Lithuanian farm-hand but the victor, who moved to 27-1 with the stoppage win was described as a promoter’s dream. Selling a hundred tickets regardless of the opponent, length of the fight and place on the bill and guaranteeing a lively atmosphere as the 100 usually consumed their own body-weight in vodka and would cheer with the intent usually saved for world-title fights. The East European in question was Albert Sosnowski. From memory, I think I described him as Andrew Golota lite which was neither accurate nor nearly as original as I believed it to be. Perhaps that was the debut of my lazy-hack cliché. I wouldn’t be without them now. 7 years on from that night and less than two years since awkward American trial horse Zuri Lawrence bested him over 8 rounds, the 31 year old finds himself facing the supposed heavyweight champion of the world on Saturday night. Despite some small improvements, his victories over Paulo Vidoz and Danny Williams – the one’s which secured the European title and enough renown to force observers to stifle the guffaw this contest should be met with – were as much to do with the irreversible decline of the two veterans than any belated discovery of greatness in Sosnowski who turned pro almost twelve years ago. In truth, and despite my severe reservations about the credibility Vitaly Klitschko appears to have built up beating fat, old men, this fight shouldn’t last beyond 4 rounds. But I hope the promoters realise how much ale his fans will sup even in that short time. Because I wouldn’t want to be the one to tell them the bar was dry – they’re assured some sorrows to drown.